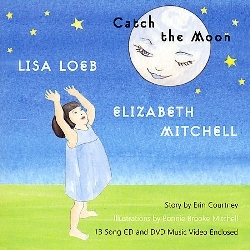 Catch the Moon is a children's album recorded by longtime friends Lisa Loeb & Elizabeth Mitchell. Liz Mitchell is a noted performer of children�s music and key member of the modern rock band Ida. for this release, folkie Lisa Loeb has followed the lead of other adult-music artists (including Kenny Loggins and her co-pilot on this album, Elizabeth Mitchell) in making a disc of children's music that can be enjoyed by all ages. Some of the songs are lyrically pitched exclusively to the toddlers (e.g., the traditional number "Little Red Caboose" and the traditional adaptation of "Big Rock Candy Mountain") while others are a tad more sophisticated (a nicely revamped version of "Oh Susanna" and a lovely take on Bob Dylan's "New Morning"). Then there is the laudable ethnic content: "La Manita" (Spanish traditional), "Donguri/Rolling Acorn" (Japanese traditional), and "Fais Do Do" (French traditional). The original song "Stop and Go" is a "rocky" participation number and tons of fun, while "Catch the Moon" (also original) is dreamily poetic. And there's never been a more tender version of "Twinkle Twinkle Little Star" than the one found here. The songs are rendered in a folk/country acoustic minimalism that is, in a word, enchanting. And the CD comes encased in a children's board book written by Erin Courtney and illustrated by Bonnie Brooke Mitchell. Catch the Moon is a record that the young ones can enjoy (or go to sleep to) while also being entertaining for the rest of the family, even after many plays.